Merryfields Barn01873 810013work Self-cateringLocated in the hamlet of Ffawyddog (meaning 'beech grove') in the Brecon Beacons National Park, with stunning views of nearby Crickhowell and the Black Mountains (including the Sugar Loaf and Table Mountain), Merryfields Barn is a cosy, modern barn conversion built to a high specification by local craftsmen. Completed in 2009, the property has one double and one twin bedroom upstairs, with oak beams, doors and floors. Downstairs, there's a limestone floor and under-floor heating throughout, and a modern boiler and thick insulation ensure that you'll never be cold. All rooms boast fabulous views. The oak kitchen is well-equipped - there's a washing machine, dishwasher and tumble dryer - and the property has many home comforts such as HD TV and DVD, Wi-Fi internet access and hi-fi. The walk-in shower/wet room and Japanese square bath provide the finishing touches. At the front of the property is a patio area which enjoys fabulous mountain views over an orchard. At the rear, oak French doors open onto a large, secluded area with a barbecue and garden furniture, for guests to enjoy al fresco eating on warm evenings. Adjacent to Merryfields Barn is a large paddock for use by guests, with a small stream and fenced-off area for dogs. A tarmac drive leads up to the property and parking is available for three cars. Linen/towels included in price. Fuel surcharge from 1st Oct - 31st March. Dogs welcome £15 per week. A short walk takes you to the Monmouthshire and Brecon Canal, where you'll find newly-refurbished footpaths, narrow boats, kingfishers and bluebells. Further down the road is a 9-hole golf course and the pretty village of Llangattock, with its narrow alleyways and 13th century church. Across the River Usk is the charming market town of Crickhowell, renowned for its high-quality shops, galleries, restaurants and cafés. 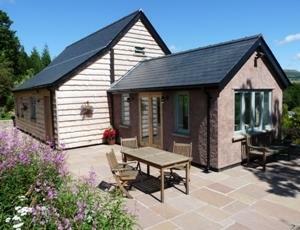 Located in the hamlet of Ffawyddog (meaning 'beech grove') in the Brecon Beacons National Park, with stunning views of nearby Crickhowell and the Black Mountains (including the Sugar Loaf and Table Mountain), Merryfields Barn is a cosy, modern barn conversion built to a high specification by local craftsmen. Grid ref 51.85611 N, 3.15665 W.
From Brecon: take the A40 to Crickhowell and turn right opposite the Shell garage, just before the town centre. Drive down to Crickhowell Bridge, cross the River Usk, turn left on the far side and then immediately right towards Llangattock village, with The Vine Tree pub on the corner. From Gilwern/east: Take A4077 from Gilwern towards Crickhowell and turn left just before Crickhowell bridge, with The Vine Tree pub on the corner and proceed into Llangattock village. In Llangattock, go past The Horseshoe pub on right and then turn first right (this takes you through a narrow part of the road). Stay on this road (the church comes up on the right), go over a speed bump, past The Old Rectory hotel on right, up the hill, over the canal bridge and keep going until the hill levels out. At this point, you'll see a Victorian lamp in a garden on the left and a stone wall on which there's a 'Merryfields' sign. Turn left into the drive and go straight on through the opening and up the drive to Merryfields Barn. There's a parking area for 3 cars.